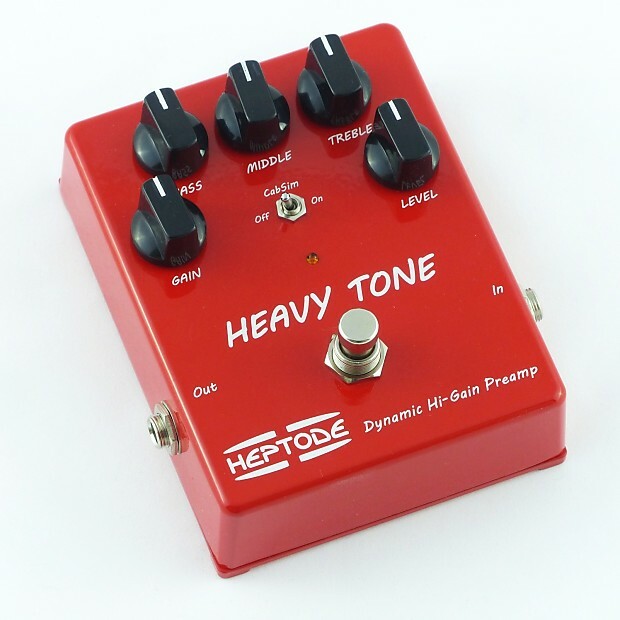 The HEAVY TONE from HEPTODE, inspired by the famous Soldano SLO-100* Overdrive channel, has this typical High Gain sound that was found in the 80’s tube preamps. Based on an innovative fully analog technology, the HEAVY TONE simulates the warm sound of tubes and preserves their dynamic characteristics. As a preamp, plugged in the “power amp” or “FX return” input of an amplifier. As a classic pedal, plugged in the guitar input of an amplifier. Plugged in a mixer or a sound card input. The CabSim switch activates the Cabinet Simulator, which is often used when the pedal is connected to a mixer or a computer. The footswitch activates the effect (LED is on). When the effect is not activated, the input signal is directly forwarded to the output connector Out (True Bypass). Heptode pedals carry a 2 years limited warranty.